The ever evolving Emirate of Dubai is welcoming a budding and powerful accomplice - the creative entrepreneur. The Dubai Creative Clusters Authority (DCCA) describes the creative industries as those that use intellectual capital as their primary input. Creative entrepreneurs, then, are those who turn their creative talents into businesses or creative enterprises. Launched in 2014 the Authority aims to forge “Dubai’s global reputation as a leader in creativity and a hub for innovation.” Some of the communities under its umbrella are Dubai Studio City, Media City, and Internet City. It also processes freelance visa applications and hosts Dubai Design District (d3), the region’s first master planned incubator for design and fashion. Since its launch in 2013, over 200 business have come on board at d3. Dubai, in fact, is a blank canvas for artist and graphic designer, said Clare Napper, below. She left her job as head of design at global advertising agency Saatchi and Saatchi to start her own studio and take on independent projects. This article was originally published on Wamda on October 15, 2015. 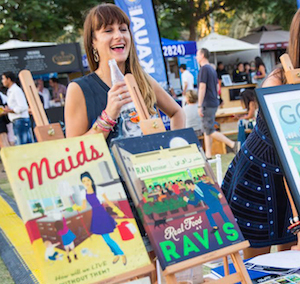 Events like the Emirates Airline Festival of Literature, the Middle East Comic Com, Dubai Design Week, the Quoz Arts Fest and the Dubai Comedy Festival are not only pioneer regional gatherings, but also valid snapshots of the Emirate’s brewing creativity. The creative hubs of the world have conventionally belonged to New York, London or Paris among others. With evidently thriving creative minds, a solidifying infrastructure, and ample possibility, will Dubai be the next New York, London, or Paris? With a contract in hand, entrepreneur and world renown DJ Charl Chaka, below, moved to Dubai in 2004. That didn’t stop him from looking for as many ways as possible to get involved in and establish himself in the local scene. Chaka eventually started contributing to Infusion Magazine, Dubai’s longest running music and nightlife guide. Now, he owns, and is a managing partner of, Infusion Group, home to the same magazine along with an events company, entertainment group and a record label. On the other side of the Emirate, is Alserkal Avenue. Founded in 2007 and repurposed from an old industrial space, Alserkal pits itself as “the region’s foremost art and cultural neighborhood.” When it opened up the application process for its 50 units, more than 400 businesses responded. Vilma Jurkute, director of Alserkal Avenue, believes Dubai already has the necessary creative talent with an organically growing creative ecosystem. The challenge remains in translating those talents into viable businesses. “Dubai is the reason we are here,” Jurkute said. “There are different ways to pursue a city’s art scene - a government initiative, a private pursuit, etcetera. Dubai is already a sustainable commercial market with a friendly macro-economic system. The art scene here grew naturally. “The status of creative entrepreneurship is growing in terms of infrastructure, but the opportunities Dubai offers transcend the existing infrastructure,” she added. Paul Frangie, a model, chef and host of This Dude Knows Food, grew up in Dubai, left for college, and then returned to pursue his passion for food, television and travel. Frangie will soon launch Hapi, a fitness and diner lifestyle concept, on Alserkal Avenue. Indeed, Dubai is an eight hour flight away to more than 90 percent of the countries around the world with Dubai International Airport being the world’s busiest in terms of international passengers. Dubai has already begun exporting creative talent globally. 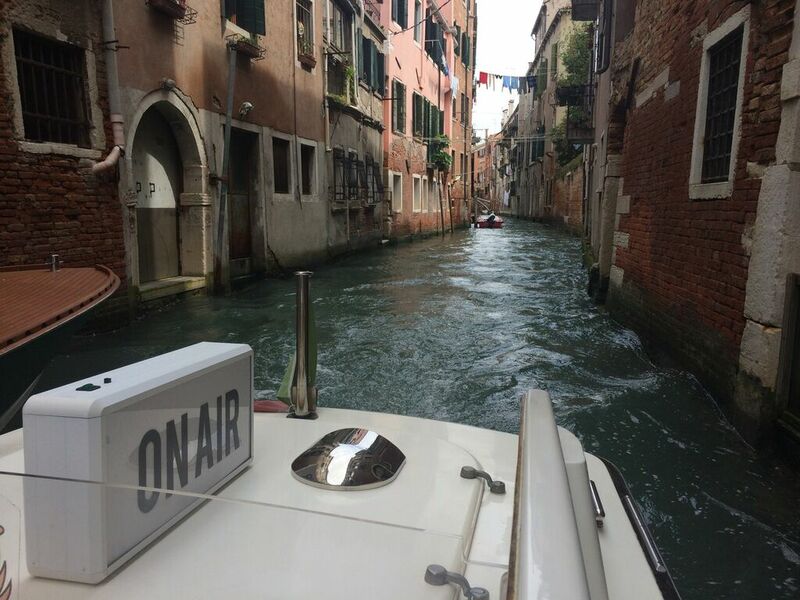 In January 2015, the Avenue commissioned the Safina Radio Project, a boat transformed into a recording studio on the Venetian waterways, serving as a platform for exploration and exchange. The first Iranian artist to hold a solo exhibition in New York City’s Guggenheim Museum, Monir Shahroudy Farmanfarmain, is a resident of The Third Line art gallery at the Avenue. Napper is not the only one convinced of the power of practicing one’s passion. For both Chaka and Jurkute, being continually involved in what one loves regardless of circumstance is an integral stepping stone to becoming a creative professional, let alone an entrepreneur. But, that was her “fun dream job”. Still seeking a creative outlet, she began documenting her life in Dubai through her art. The result was the well received Highlife Dubai collection - 18 artworks based on vintage poster ads of the 20th Century.